Anniversaries are a time to honor the past, celebrate the present, and anticipate the future. Through this book, we warmly invite you to join us in this journey. It is impossible not to feel the goodness of ARC as you turn the pages of this heartwarming story and see all the smiles of past and present ARC clients and staff members. Those happy faces speak loudly about the love, respect, and outstanding assistance that this organization has given to North Country families. Chartered in 1954 by families who wanted better lives for their children with Down syndrome, Clinton County ARC (Advocacy & Resource Center) has grown and expanded widely. Headquartered in upstate New York, this not-for-profit agency assists adults with developmental disabilities to participate actively in home and community life through employment, skills development, social activities, and volunteerism. Our 88-page book tells the ARC story in a straightforward but elegant format. Artwork by ARC clients adds an especially warm touch. Photos, artifacts, and memories capture the heart of the agency and place it in the context of a larger history — the one in which people with disabilities have emerged from the shadows to be welcomed into the mainstream. 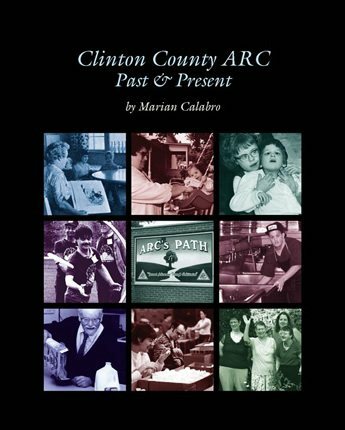 Handsomely produced within a nonprofit budget, Clinton County ARC: Past & Present reaches all of ARC’s stakeholders: employees, volunteers, donors, community partners, state officials, colleagues at other ARCs, and most of all the people and families it serves. 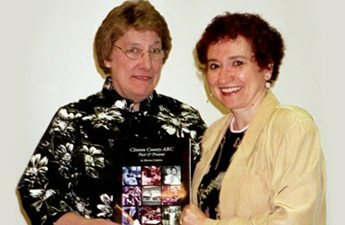 Award Winner: Clinton County ARC: Past & Present won a 2010 Apex Award of Excellence for special purpose writing. Apex Awards are based on the quality of their graphic design, editorial content, and communications excellence. The competition drew almost 4,000 entries. The book came out just after Clinton County ARC had redesigned its website. At the clients’ request, we patterned the cover design and color scheme on the site’s home page. 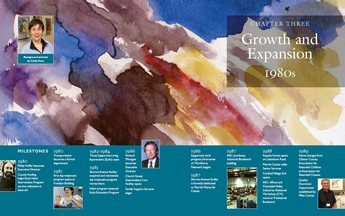 Chapter openers feature background art by individuals served by ARC. 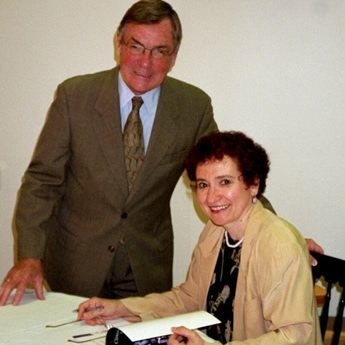 Marian at the book signing, which took place at ARC’s annual meeting.